Brontë told me today that the cat took her diaper off and applied diaper cream. It was really nice of him to help out, since we have so much going on around here. 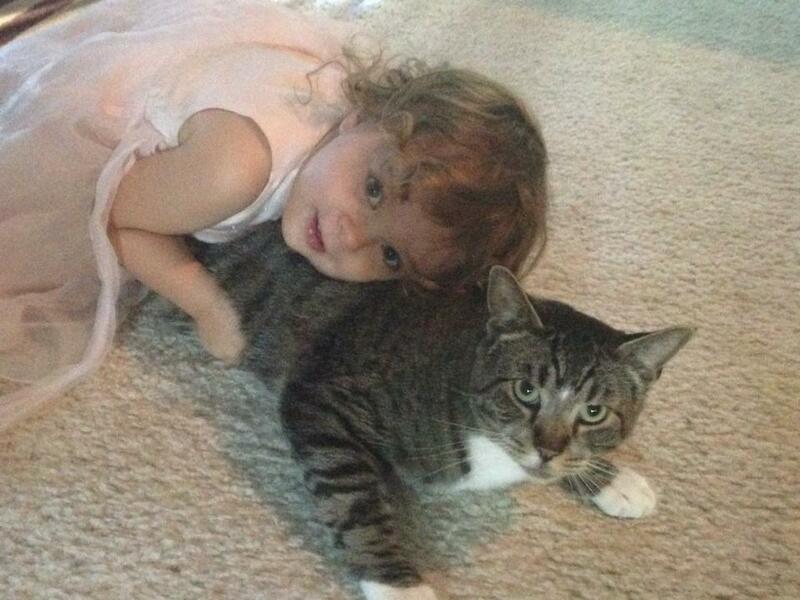 This photo of my daughter and our resourceful cat will likely inspire a range of reader reactions. Some (probably pet owners) will think it’s adorable. Others will be horrified. In the horrified group, some will have noticed the “help me” look in the cat’s eyes. Well… my daughter loves the kitties a lot, sometimes a lot like Lenny from Of Mice and Men. She tackles them and buries her little face in their fur. The cats have shown tremendous patience throughout her exuberant toddlerdom, mostly indulging her aggressive love, and occasionally running away when she gets too rough. When she truly crosses the line (trying to yank whiskers out or pulling on tails), they lightly pepper her arm, which has proven a far more effective training tool than our insistence that she be more gentle. Overall, the cats have a wonderful relationship with our daughters, packed with snuggling, purring, and hysterical string chasing. Pets are dirty and will make their children sick. I’d like to address the hygiene issue, for the benefit of potentially relocated pets everywhere. If your child has severe allergies or a compromised immune system, then yes, it may be a good idea to get rid of your pets. For everyone else, however, pets will actually improve your child’s health. Yes, cats and dogs are a little bit dirty (by human standards). They run around outside, rolling in dirt and various plants, crapping in litter boxes or the open air, and don’t scrub themselves with soap and hot water. They are covered in germs. The very idea induces shudders amongst ultra-hygienic Americans, as they bathe their hands in sanitizer. But you know what? Americans are too damn clean. I know, I know… that sounds crazy. Clean is good. Clean is pure. Clean is healthy. We have all kinds of pleasant associations with cleanliness, from happy clean bodies to sinless souls. Ivory soap is 99 44/100 % pure, so pure it floats (and in my experience, so caustic that it leathers your skin in a few washings). Clorox cleans the “purest clean.” Cover Girl is “clean makeup” (even though it makes everyone break out). We Americans really like clean. And if there is anything we need to keep clean, it’s babies. They came into the world clean, clean of body and spirit, and we need to keep them that way. Why would we want anything dirty around our clean babies? Because it’s possible to be too damn clean and Americans have crossed that line. Somewhere around the turn of the century, we figured out that survival rates in hospitals improved drastically when doctors washed their hands. Before that, doctors would handle patient after patient, some of whom had deadly infectious diseases, without washing their hands. Sometimes they even handled cadavers, often the cadavers of people who died from fatal infectious diseases, then went on to meet sick patients with compromised immune systems or even perform surgeries. Obviously, disease spread like wildfire under these conditions and there was a mass campaign to bring sterilization and better hygiene to the medical profession. This is all very reasonable, but things eventually got out-of-hand. I blame advertising. Marketers jumped on the opportunity to convince everyone that you needed to buy their products and use a lot of them if you didn’t want to become an unhealthy, socially-unacceptable slob. People used to wash their hair weekly, but now you need to wash it every day, twice (lather, rinse, and repeat). Doesn’t matter if you have dry hair, because instead of washing less frequently, you should use a shampoo specially formulated for dry hair. You’ll wash out your styling products and need to apply more, which means you’ll need to buy more. You also need to scrub every inch of your body with antibacterial soap, every day, and apply antiperspirant. Anything else would just be gross. Baby care became increasingly sanitized, especially through the 1950’s. Cleanliness was supreme, and a reflection on the mother. Everything needed to be scrubbed, laundered, and de-germed. Upholstery was regularly vacuumed. Strollers were taken apart and disinfected, bolt by bolt. Even today, grocery stores offer sanitary wipes to disinfect shopping cats before children are loaded into them. You know what the result of all this effort has been? A crapload more allergies and asthma. You see, the human animal did not spawn in a vacuum. We were always meant to make contact with the outside world, and our immune system carefully evolved under these conditions. We have a delicate balance of microorganisms in our guts, one that can be really screwed up by regular antibacterial blasting. While we obviously need protection from really nasty, lethal germs like ebola and tuberculosis, our bodies are usually equipped to handle everyday germs. People are getting vitamin B12 deficiencies because B12 normally comes from the gut of animals, but our factory stems are blasting them with so many antibacterials that they aren’t supplying our bodies with enough of it anymore. This didn’t use to be a problem. When you get a vaccination, it works like this: you are exposed to a little bit of a germ and your immune system develops antibodies to handle it (I realize some people are against vaccination, but that’s a subject for another post). Well, when you have a cat or dog that runs around the yard, it acts a bit like a natural inoculation for your child. The pet picks up little bits of flora and fauna in its environment and brings it back to your kid. Your kid’s immune system is then familiarized with the flora and fauna and is less likely to view it as a foreign particle requiring an allergic reaction. This is counterintuitive, I realize. It feels like if we work harder to create a clean environment, we should be rewarded with a healthier child. Harder work should equal a better result, yet science supports the theory that a little dirt is good. Kids raised with pets since infancy have fewer allergies and a lower incidence of asthma. I don’t know about you, but when I was a kid, I used to eat grapes and berries straight from gardens or off bushes. Turns out, this was a good thing. Kids eating unwashed fruit have a better balance of gut bacteria than those who eat cleaned food. You should also let your kids play in dirt. It’s good for them. Interestingly, some Swedish researchers recently found out that kids from homes that hand wash their dishes have a lower incidence of asthma, eczema, and allergies than the ones from homes with a dishwasher. This is probably because hand washing dishes removes the major germs, but doesn’t sterilize everything to the degree that a high-power dishwater does. Now I’m not suggesting everyone give up their dishwashers (I’m too lazy to hand wash everything), but it lends support to the idea that cleaner isn’t always better. The takeaway from all this? Unless your kid has a specific condition, you probably don’t need to worry about a few germs or give away your pets. Pets are a little dirty, and that’s a good thing.